Since the launch of 6 Music on March 11th, 2002, our brilliant presenters have played nigh on a million records into your ears (seriously....based on an average of 240 tracks a day we are nearly at a million... maybe even over. Amazing, eh? ), and many of those tracks were new at the time. So as we say farewell to 6 Music's 10-year anniversary celebrations, we here at the station thought it was high time we looked back at all the brilliant new music we have played on air during our eventful life so far. One day in the office, in the autumn of last year, a few of us were talking about our favourite records released during the 10 years we've been on air. As with any musical conversation in 6 Music towers, a polite debate swiftly turned into a passionate argument and lo, the idea of 6 Music's Greatest Hits was born. Starting today, 6 Music is officially asking, "What is the greatest song released during our lifetime?" Between the 6 Music presenters and staff in the office, after spending the last three months or so sifting through the thousands of songs released in the last 10 years, we somehow came up with a shortlist of 100 tracks we think truly are 6 Music's Greatest Hits, all of which were released between March 2002 and the end of 2012. And in the spirit of transparency, I'm not going to lie - the whole process was a nightmare. A fun nightmare, but a nightmare all the same. I had a full-on terror dream one night where I was attacked by flying Regina Spektor records. Trying to be unbiased when faced with songs you personally treasure is agonising. There are a ton of tunes I would have loved to have included in this list but couldn't, and the same goes for all of us here. We didn't have any particular criteria when shortlisting aside from gut feeling and the comfortable knowledge that the list would never truly be finished - if we were asked to do it all again today no doubt at least ten of the songs on the list would change - but it is what it is, and in actual fact I think it looks and sounds pretty strong. If an alien came down, ended up having a tour of 6 Music and via a clever translation machine asked us, "Inferior Earthlings... What is this thing called alternative music and what is the most excellent example of it from the last ten solar cycles", we would happily give them this list. I digress - this is where you come in, dear listener, to the world's finest alternative music station. We want you to vote for the track you believe to be the pinnacle of musical achievement during our lifetime from our list of 100. Go to the voting page now to see the list of 100 tracks in full and cast your vote, and click on the links to Spotify, Deezer and YouTube where you can listen to special playlists featuring every track included in the list. 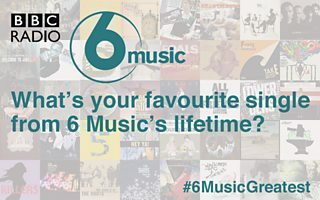 Tell us what you think on our Facebook page or use the Twitter hashtag #6MusicGreatest. We genuinely can't wait to find out what you think about the list, good or bad. Voting closes Friday 25 January, and be sure to keep Friday 1 February free as we'll be counting down the 100 songs in the order you voted for them across the day, starting in Shaun Keaveny's Breakfast show at 7am GMT, and concluding with Steve Lamacq from 4-7pm GMT.